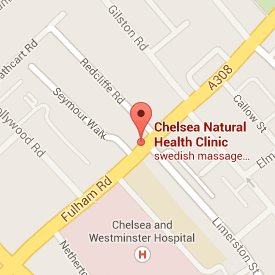 Herbal Medicine by Charles Powell at Chelsea Natural Health Clinic, Fulham Road, SW10 9PJ. Herbal remedies have a therapeutic action that is gentle and restorative, and very well suited to children. In addition to easing specific symptoms, they enhance the body™s own natural healing capacity. Made from plants whose medicinal properties can be traced to the presence of various pharmacologically active ingredients, herbs work in harmony with the body. We have found that children whose immune systems have been compromised by antibiotics will often present with eczema, hayfever, asthma, IBS and other illnesses By treating them gently and holistically, health can be restored often where symptoms have been continuous, sometimes for years. Similarly, children suffering from allergies or intolerances can find relief through herbs, says Medical Herbalist, Charles Powell. Whilst the benefits of herbs, including Thyme, Sage and Rosemary, all of which are strongly antiseptic, can be used in cooking and salads, when it comes to herbal remedies (infusions, tinctures, salves, etc) only the gentlest, most tried-and-tested ones are recommended for children. What kind of conditions is it useful for? Herbal medicine can help treat and even prevent many childhood conditions. How does it work on my child? Whilst you can treat your child to some extent, with herbs, at home, a consultation with a medical herbalist will include a full medical history, and an examination if necessary. The herbalist will then treat your child as a whole person, addressing the underlying cause of symptoms. A qualified herbalist will also be aware of the appropriate herbs and doses for your child in order to avoid any possible toxicity. Western herbal medicine has a history of thousands of years and remains the most widely practised form of medicine worldwide with 80% of the world’s population relying on it for primary healthcare. Herbal medicine treats the whole person, addressing the underlying cause rather than using conventional medicine which suppress symptoms. As a result the side effects associated with drugs can be avoided.